German superstar cyclist Marcel Kittel got his season started off perfectly, winning the first two stages at the Tour of Dubai. He destroyed everyone in the opener, then took Stage 2 with an late comeback. However, Kittel did not win Stage 3 this morning, partially because he got clocked in the face. 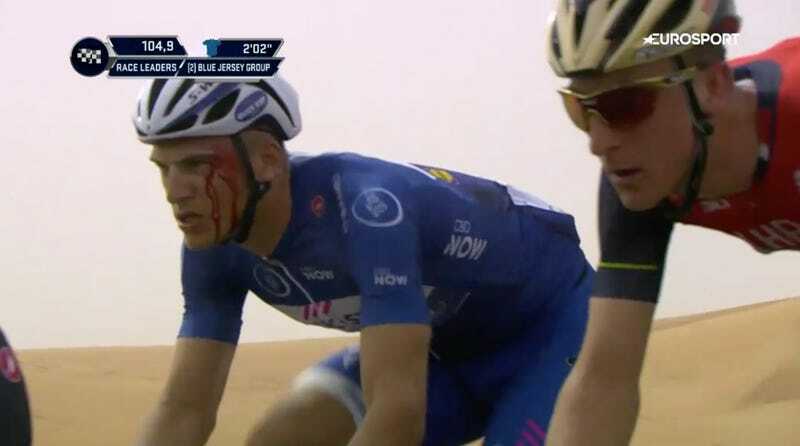 Sadly, there is no footage of the punch, but Kittel was bleeding rather profusely above his eye. His team lodged a complaint against Astana’s Andriy Grivko for socking their star sprinter and the Ukrainian rider was kicked out of the race. Kittel later called for Grivko to get a six-month ban, and said, “I guess Grivko had a coffee too much this morning, I don’t know what happened with him.” Kittel said that he and Grivko got into an argument as they were jockeying for position in the pack and Grivko got mad and socked him. Grivko later accused Kittel of bullying him and a teammate out of the way with his shoulder and putting the whole peloton at risk of a high-speed crash. Either way, Kittel and rode limply over the finish line in eleventh after not really sprinting at all. He is, as he sort of intimated, up for a rematch.